As more guys start paying attention to body grooming, the number of shaving gadgets in our bathrooms is starting to multiply. 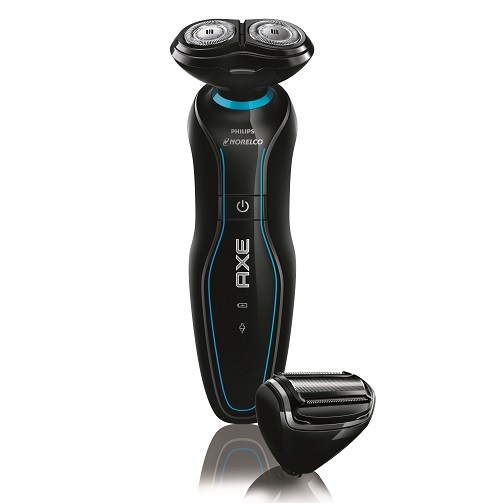 Now we have Axe and Norelco teaming up for a new product exclusively available at Walmart – the AXE Philips Norelco Shave & Groom Kit. It’s basically two groomers in one as it has two heads that click on and off. First it has a traditional Norelco shaver that gives you the comfortable and close shaves you’ve come to expect from Norelco. But then that snaps off and you can replace it with skin-friendly bodygroomer head and length comb. This you can use to groom or shave different parts of your body to make the ladies happy. 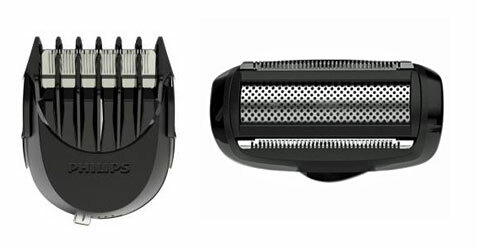 The shaver is cordless and you can use it as a wet or dry shaver, so it’s very flexible. The only quibble we had is that it doesn’t come with a carrying case, but this offers a ton of value for all the features. We tried it out and it worked perfectly for all our needs. So check this out as it can be the perfect shaving gadget for your all your needs. Remember, in today’s world grooming everywhere is expected! It also makes a great gift with Father’s Day around the corner. Tags: 2013 Father’s Day Gift Guide, Axe, electric shavers, Father's Day, Father's Day Gift Guide, gadget gift guide, Gadget gifts, gadget reviews, gadget reviews for guys, gadget reviews for men, gadgets for guys, gadgets for men, gear for guys, gear for men, gear reviews, gear reviews for guys, gear reviews for men, grooming for guys, grooming habits, grooming habits for men, grooming product reviews, grooming product reviews for guys, grooming products for guys, grooming products for men, grooming shavers, grooming stuff for guys, grooming stuff for men, manscaping, men's grooming, Philips Norelco, Shave & Groom Kit, shavers, should I manscape? With Father’s Day coming up, men’s grooming products are always reliable favorites for dad. I remember giving cheap after shave as a kid, but now you can step things up a bit with high-quality products at stores like The Men’s Shop at ULTA Beauty. The site has a great selection of gift ideas at any price point. The experts at ULTA have identified this season’s hottest items from classic colognes to lighter body sprays perfect for gym bags and traveling, and Father’s Day favorites including shave gels and hair sculpting clay. ULTA is also gifting a free insulated tote or roll-up picnic blanket with any $30 fragrance purchase for dad! They sent us several samples to try out, including the Lacoste Rouge Eau de Toilette pictured above and the Dolce and Gabbana The One Sport Eau de Toilette pictured here to the right. Both are excellent fragrances that would upgrade the cologne collection for most men. This Lacoste fragrance for men has a clean, crisp, fresh scent with a light and cool feel. The Dolce and Gabbana product is also a fresh, clean fragrance with “light and energetic top notes accompanied by an unmistakable Mediterranean aroma of rosemary, the freshness of water and saltiness of the sea. The middle notes feature sequoia wood enhanced with the energy of cardamom. Patchouli and musk naturally compliment the fragrance’s base notes.” Basically, it also will make you smell great! Check these and other products out and find something cool for everyone on your list this Father’s Day. Check out our guide for more ideas.